So we round off our editorials on Smartphone choices with Why Android? I love having the opportunity to write about all technology and all phones. When Gordon suggested we do these articles I thought it would be a great chance to see how our personal experiences with phones have led us to where we are today and to see how all of you can relate to (or can’t!) the accounts myself, Gordon and Michael have made. A bit about my history with phones first. Since the 088 days in Ireland I’d say I have had a phone from just about every manufacturer there is (except BlackBerry, sorry Gordon!). Mobile phones have always been important to me. I love the speed at which the technology progresses and love seeing more and more features becoming available on phones. I usually change my phone a few times a year. I have had three this year so far. What hasn’t changed in the last two years or so though is that they have all ran Android. When the iPhone originally launched I had pretty mixed feelings about it. On one hand I thought it was the phone I had been waiting for, great capacitive touch screen and a form factor that I always thought was crying out to be used. But on the other hand it lacked some key features that I felt were too much of a sacrifice, so I gave it a miss. That changed though when the iPhone 3G was launched. The increased amount of features was enough for me and I bought one on launch day. At that time I felt there was no other phone that could compete with it and it sold millions. By the time the 3GS was launched Android was starting to make some noise but I felt it still wasn’t able to compete hardware or software wise with the iPhone so I decided to buy a 3GS. At this stage though my eye had been turned by Android and my love affair with the iPhone was starting to run thin! I was starting to get frustrated with iOS. The lack of multitasking was the main cause. As the months went on I decided I’d had enough and it was time for a change. The choice of Android phones still wasn’t great at that stage so I took a gamble and bought the HTC HD2. It ran Windows Mobile 6.5 which was a complete dog but HTC had done a good job of skinning it and making it usable with a touch screen UI. The hardware was fantastic. While WinMo did offer some of the features I felt were missing from iOS the real reason I went for the HD2 was that Android development was well under way for it and being able to Dual boot WinMo and Android was now an option. While there were the usual stumbling blocks with that, a reliable version of Android was ported to the HD2 and once I had it running WinMo was never booted again! Four more Android phones later and I now have the Samsung Galaxy S II. I had great hopes for Meego and Windows Phone 7 but one has been killed off and the other seems like it is heading that direction. I’m sure the people that know me in my personal life think I am Android mad and while I do love it, I am also always looking for the next great thing to come along. For now that hasn’t appeared. One of the other things that may surprise people is that I still look forward to every Apple Keynote when new products are being announced. The Engineer in me admires their design philosophy and their attention to detail. To have one platform sitting on top is of no use to anyone. New devices from competitors motivates everyone to push the envelope that bit further. To make their device the next big thing and to knock the other’s off their perch! From my point of view this is why….. If I had to sum it up in three words I’d say Flexibility, Functions and Choice. Android is infinitely changeable. There isn’t a setting or feature or part of it’s appearance that can’t be changed. There is a phone for every price point but there is also a version of Android to suit everyone. Android is about freedom of choice. You can choose what price point you want to enter at, what form factor you want, what firmware you want. If having a high spec phone is important to you, Android is setting the standards that other platforms are playing catch up to now. The first Quad core Android phones will be out early next year and the OS is already capable of making use of those extra cores when they come along. I truly expect these devices to start replacing dedicated media players and games consoles in our homes very soon. There isn’t a feature on any of the other platforms that isn’t already on Android in some shape or form. I often hear iOS users say “oh I’ve used Android but it doesn’t appeal to me”, but I don’t think they really have spent enough time with it or with the right version of Android. It’s usually just a couple of minutes flicking through screens and because it’s different than what they’re used to they hand it back. A couple of years ago some Chinese Developers started working on a version of Android called MIUI. They liked the Flexibility of Android but didn’t want to let go of iOS either. Here’s a video of one of the versions of it. I read one of it’s creator’s comments that his aim was to have every feature his iPhone had but also to have every feature it didn’t! This is only one of the myriad custom firmwares that are available on every Android device but this for me just shows the absolute choice you have with Android. If you don’t like something or there is some feature you want to add you just change it. How many other platforms offer anything even close to that flexibility? So I know there are plenty of you reading this now that will say this in not on offer to the “average” Android user but I don’t think that’s the case for several reasons. While not everyone will choose to install custom firmwares the same way not everyone will choose to jailbreak their iPhone or run a leaked OS on BlackBerry, it is now easier than ever to do it. On most Android devices now it can be done in a matter of minutes with absolutely no previous knowledge or experience. If you can install an App and know how to transfer files to an SD card that’s all you need. The process has become that refined now as there are thousands of people working on it’s development continuously. So if we take a complete technophobe then, that will never change any feature of the Android version that came out of the box. What about them? Where are all the choices for them? About 3 months ago Samsung hired Steve Kondik, the creator of one of the most commonly known custom firmwares for Android, CyanogenMod. This custom firmware is installed on millions of Android devices all around the world and is loved for the features and improvements it brings to the stock Android experience. Those features and improvement will now become part of the stock Samsung Android experience. Many of the features that have made HTC’s Sense UI so popular have been taken straight from custom firmwares. Android is moving at a phenomenal pace and it is being improved even further with Ice Cream Sandwich. ICS is the most polished version of Android to date. It implements improvements in the OS that were needed and adds that polish and crispness to the UI that some felt had been missing. Google is a huge part of most people’s online lives now. It is probably too big a part of mine! With that said though obviously it has it’s advantages when Google owns Android. Every part of Google that you interact with on a day to day basis on a computer completely integrates with Android. From Gmail to Youtube and Picasa, everything you do on a computer appears on the phone. All your photo albums, your preferences in youtube etc etc are all on the phone without any input from the user. I love watching films. I love watching them in HD even more! Android now allows me to watch any format film at any resolution on the phone and more importantly I can now output it straight from the phone to a HDTV. Full 1080p films in any format can be played on any TV that has a HDMI connection. Films I watch on my Mac, I can now just transfer to the SD card on the phone and continue watching them on the phone when I’m out and about. Now I know some people are lucky enough to have powerful PC’s at home that make easy work of converting films but for most people to convert a 1080p or even 720p film so it is compatible with their phone would take hours. It takes the Mobile out of your Mobile if you have to wait for everything to be converted to a different format so it’ll play on your phone! So to the dreaded topic. Adobe Flash. It would be remiss of me to write this article and not cover it in some fashion. While Flash has been a great big stick to beat other OS’s with it is becoming less and less important. Thankfully. It has been blown into proportions that it should never have been but I suppose that’s a measure of the brand loyalty that exists between the platforms. It boils down to this for me. Probably 95% of what Steve Job’s said about Flash is completely accurate. It is a battery hog. It doesn’t work the same on mobile devices as it does on computers, but it has improved greatly of late. The security risk it poses on mobile devices was massively exaggerated by Apple, the same way most security threats on mobiles are but people know it is a risk on PC’s so it made sense for Apple to portray it in that way on mobiles. For me it is something I would prefer to have on my mobile than not. I like being able to choose what programs I use and in essence that’s what it comes down to. Me having the choice, not someone else taking that choice away from me. What does Flash bring to Android that is an advantage over other platforms? It means you can have the same desktop experience on your phone that you are used to on your PC. If you navigate to a site that’s Flash based it will work. That’s not that big advantage anymore as most sites are now mobile (read not Flash compatible) optimised anyway. Where it offers the advantage is in the video. Sites like RTE’s player or Channel 4’s 4OD service work on your phone. All Youtube clips work. Will this be an advantage in the future? The answer is plainly no as Adobe are stopping development of Mobile Flash and content will be converted, slowly, to another format that works cross platform. But I still like having the choice to install it if I want. These are all obviously just my personal opinions. I know several of you will disagree with them and let’s have a discussion about it below in the comments, but they are being backed up by the numbers now. 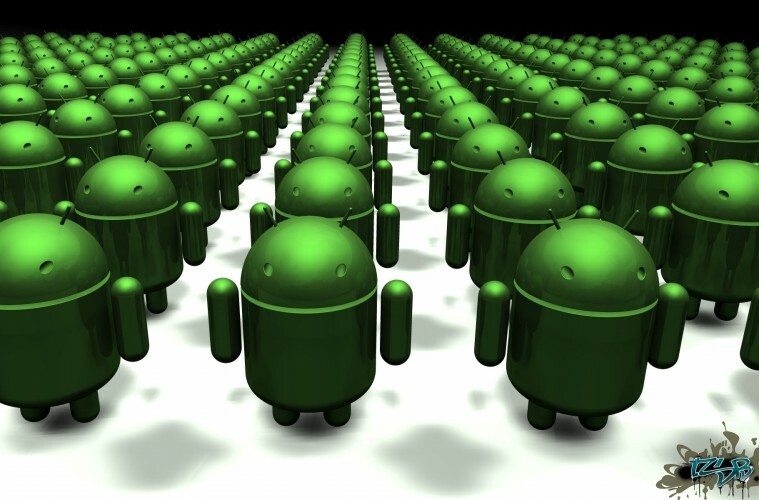 More people than ever are choosing Android. The people that are leaving other platforms are leaving them for Android. A decent spec’d phone at every price point. The choice to make your phone the way you want it to be. Access to all the features available on every platform.